Yesterday was Kamehameha Day, celebrating Kamehameha 1, the king who first united the Hawaiian Islands under one leader. In North Kohala this involved a parade featuring representatives of all the islands and ceremonies during which the king’s statue in Kapaau is draped with leis. 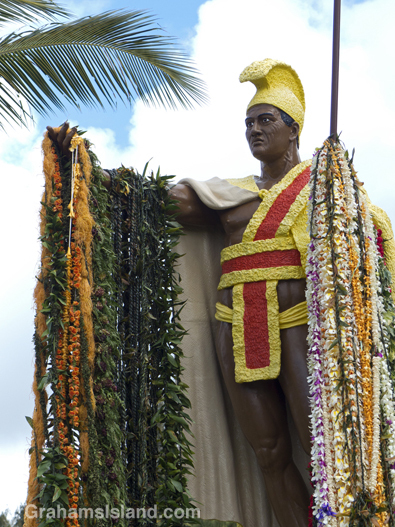 The statue in Kapaau was commissioned in 1878 for display in Honolulu. But the ship transporting it from Europe caught fire and sank off of the Falkland Islands. A replacement statue was ordered, but before it was delivered, the original turned up. It had been salvaged and sold to a junk dealer in Port Stanley. There, it was recognized by a British ship’s captain who bought it and took it to Honolulu. The statue was in poor condition after its time in the sea and some rough treatment during its salvage and subsequent transport. In the end, the Hawaiian government decided to erect the replacement statue in Honolulu since it was in better shape. The original was restored and sent to Kohala, which is where Kamehameha 1 was born. 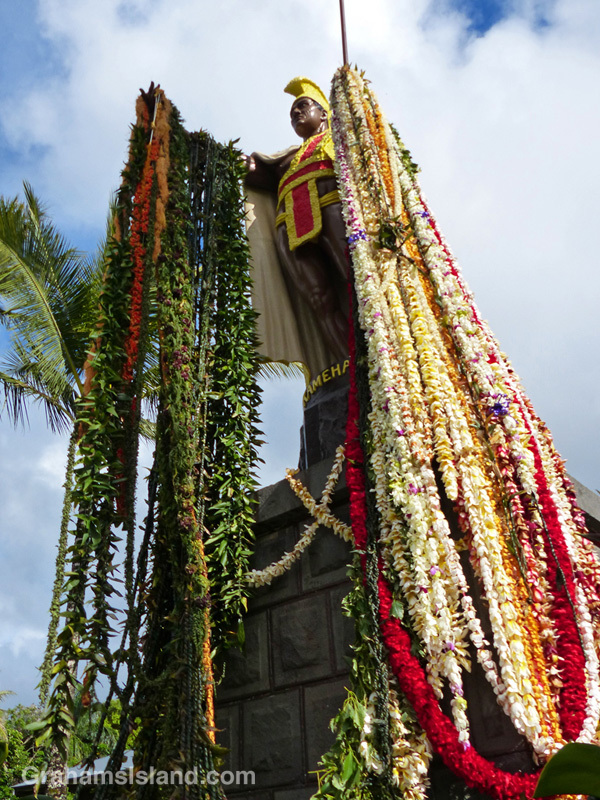 Unlike the statue in Honolulu, which features gold gilt, the Kohala statue is painted, a local preference which persists to this day.